Are you planning on quitting drugs and alcohol?Learn when you can do it at home and when you need medical supervision. We have come a long way in the last few decades. Before the 1970’s public intoxication was treated as a criminal offense. People arrested for it were put in drunk tanks (within local jails). These tanks are where they went through withdrawal — with no medical intervention. Social views have changed. Two things happened to help shift our thinking. First, the American Medical Association (AMA) took the official position that alcoholism (and now substance abuse) is a disease. Second, the National Conference of Commissioners on Uniform State Laws adopted the Uniform Alcoholism and Intoxication Act. This did not carry the weight of law, but their views changed the perception that humane treatment should be made of people with addictions. Detoxification is a process to manage withdrawal symptoms. This is done by clearing toxins from a person who is physically dependent on drugs or alcohol. The goal is to minimize physical harm. Important note: this is different from substance abuse treatment or rehabilitation. Detox is the medically supervised process to prevent life-threatening problems that would appear, if the addict was left untreated. 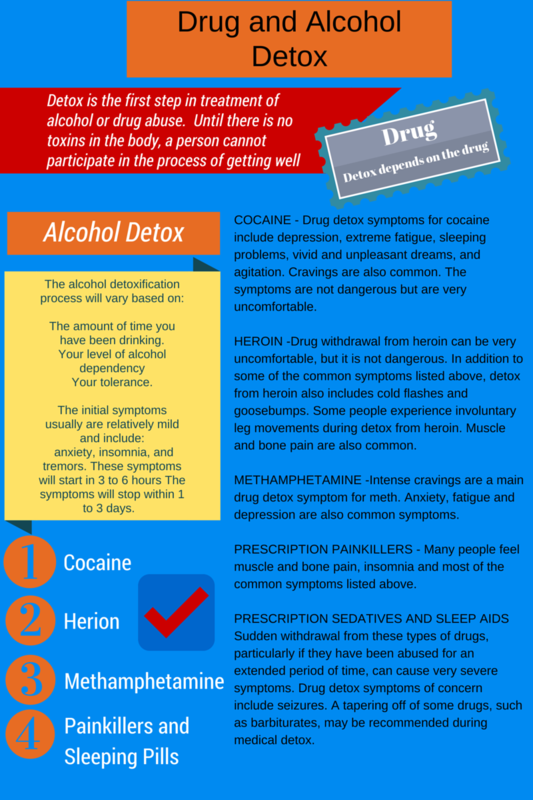 If you are heavily addicted to drugs or alcohol, a medical detoxification can save your life. This is because within a few hours of your last drink or drug, your problems will begin. Severe symptoms are convulsions, high blood pressure, and loss of consciousness. This puts you at a risk of injury or death. Also keep in mind, that you can become aggressive and violent, which puts your family and friends at risk. See a doctor to be evaluated before you abruptly stop “using”. Alcohol – Yes, after long-term use, withdrawal from alcohol can kill. Alcohol withdrawal syndrome can take on mild, moderate, or severe forms. If while withdrawing from alcohol a person develops a fever, extreme nausea, diarrhea, or DT (delirium tremens), they need to be rushed to see a doctor as soon as possible. In fact, alcohol withdrawal after heavy, chronic use is best-managed under the care of a doctor or a professional medical detox unit. By using medications that relieve withdrawal symptoms, these professionals can essentially eliminate any of these risks. Benzodiazepines – Benzos were introduced as a replacement to barbiturates that were causing common overdose cases, many of which resulted in death. Nevertheless, withdrawal from extended use of benzodiazepines can kill. Whether Xanax (alprazolam), Ativan (lorazepam), Valium (diazepam) or other variations, long-term use of Benzodiazepines requires medical supervision to be completed successfully with minimal side-effects and risk to the patient. Normally, the withdrawal process is managed by slowly reducing the dose and transferring the patient from a slow acting, to a long acting, form of the drug. Still, full resolution of benzodiazepine withdrawal syndrome can take up to 6 months (or even longer). Ultra-rapid Detox is controversial and not covered by most insurance. Click here for additional information. Opiates – Many people are surprised to learn that in most cases, withdrawal from many opiates is not deadly. Still there are some very important exceptions. Overall, I would recommend checking in with a physician and conducting opiate withdrawal in a controlled setting. Withdrawal under Suboxone or Subutex can be far less horrific although many still report severe discomfort at final cessation. I am a bit surprised to learn that withdrawal from cocaine, marijuana, crystal meth, ecstasy, GHB and many other recreationally used drugs will not lead to death in most cases. However, it will make you uncomfortable. What about me – I qualify to detox at home? Follow this suggestions, of course after you have seen a doctor. The painfully obvious first step is to stop drinking or doing the drug. Drink tons of water. This is another obvious suggestion but it can not be overlooked. Water will flush the toxins out. Downing 100 oz a day should be your goal. I know this seems like common sense, but a healthy diet, will give you strength and nutrition. Cut down on sugar and greasy foods. Eat as many fresh foods as you can afford. Simple foods are your best bet. Things not out of a can is your aim. Detoxifying items to include: berries, green leafy vegetables, lemons, parsley, ginger, cabbage, yogurt, avocado and almonds. Side note: I detoxed at home and craved raw cabbage doused in balsamic vinegar. When I asked my doctor about this craving, he said it was a naturally detoxifying combination. Who knew? Exercise will eliminate the unhealthy toxins through your pores. It also helps you mentally by producing endorphins that will help your mood. Sauna or epsom salt baths are a nice, if you have access to them. Cut down on coffee and cigarettes. I would not suggest trying to quit two things at once. Surround yourself with only loving and supportive people. If you live alone, have a family member or friend come over. The drugs are out of my body, now what do I do? Start a treatment program, go to rehab, see a therapist etc. Now that the toxins are out of your system, you will need skills to live your newly sober life. Put health, safety, and a successful treatment plan together for your new self. Great article – thanks for sharing! my withdrawal experience is what keeps me sober, knowing that I never want to feel like that again. Great article. I really found the information on lorazepam extremely helpful. I am going to start coming off that in the spring. Didn’t realize it would take so long to get out of system. Brilliant. How could I forget ginger, cinnamon and peppers. I never researched mint, but that makes a lot of sense. Side note: I am easily nauseated from (as little as) a car ride. I slice ginger very thin and keep it stored in a little rice vinegar and sugar (the chef folks would call that a “quick pickle”). It tastes similar to the Japanese ginger you get at a sushi restaurant, but it’s fresh and more healthy. It is an invigorating little fix for many things. Thanks for indulging me with your knowledge. Very helpful article for those needing a place to start 🙂 I can’t agree more with the drinking water part. It makes such a difference! Good stuff! And an important site you have here. The first step is understanding. Medical and therapeutic supervision is essential to an effective detox as well continuing support meetings. All three elements assures the individual that she is not alone; however, in an emotional turmoil, a person may miss the steps. Great Post!! Thanks. I have been searching for detoxing finally I found info from here. Is it your detox facility. I am a bit confused.